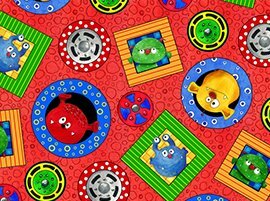 Desiree's Designs - Monster Truck Mania Perfect for decorating a kids' bedroom – curtains, pillow cases, wall banners, quilt – or make a shower curtain for their bathroom! Kids will identify with this collection as there are a number of video games for little ones that use monster trucks for the theme. Desiree designed the project quilt which looks as though there are tire tracks running the length of the quilt!